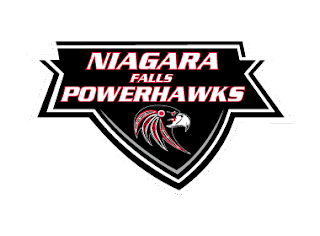 The Niagara Falls PowerHawks will be back in action this weekend at the Hyde Park Ice Arena as they take on the visiting Jersey Shore Wildcats. Saturday’s contest will faceoff at 6:00pm, while Sunday’s game will get underway at 1:00pm. Both teams are coming off splits in their opening weekend matchups. The PowerHawks won their debut game Saturday evening, 5-4, over the visiting Pittsburgh Vengeance. Spencer Hrynczak scored the first goal for the newly dubbed Niagara Falls team. Pittsburgh took control of Sunday’s game, and went home with an 8-4 victory. Meanwhile, Jersey Shore opened the season with a 5-4 loss to the Maine Wild at the Jersey Shore Arena. The team rebounded with a 7-2 victory over the Wild on Sunday. Last season, the Wildcats advanced to the second round of the playoffs, but were defeated by the Binghamton Junior Senators in those games. All PowerHawks home games can be heard LIVE on Niagaraswatercooler.com.